This savory, slightly rich walnut bread has become a multitasking favorite in my galley. 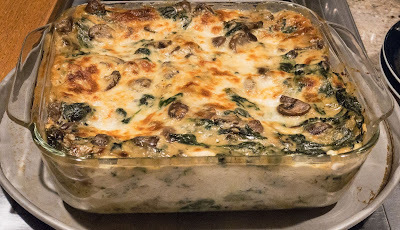 It is uncomplicated to make, holds well for days on the counter (for months in the freezer), and tastes downright delicious. What's not to like?! While it might resemble a hearty rye bread, the recipe calls for any standard all-purpose flour. I used King Arthur unbleached AP flour, but attritute the loaves' brown interior to the walnuts rather than the unbleached flour. Walnuts will do that. 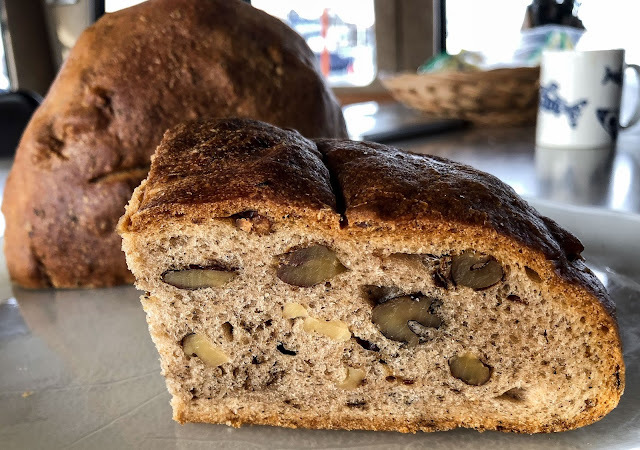 We enjoy a thick slice still warm from the oven, often slathered with butter as a stand-alone treat or maybe as an accompaniment to a hearty bowl of soup. 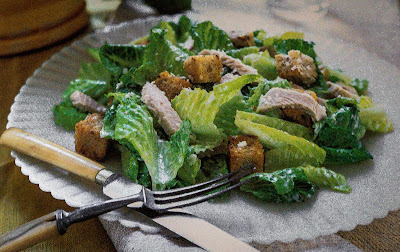 Add chunky walnut bread croutons to a turkey Caesar salad for a filling entree. Toast thin slices for open faced sandwiches or appetizer bases. 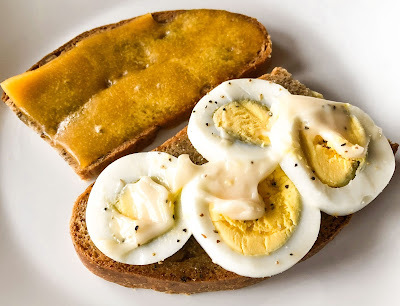 Dip crispy walnut bread soldiers into your morning's soft boiled eggs. See, definitely a multitasking favorite! The recipe calls for 4-1/2 to 5-1/2 cups of flour, a wide range that should not be a problem for anyone with even a little breadbaking experience. "Smooth and elastic" is the key phrase; aim for a workable dough without adding too much flour. Like to play with ingredients? add some of your favorite herbs, or maybe a handful of feta cheese crumbles. Rosemary or fennel? Mmmm, maybe shallots or garlic? 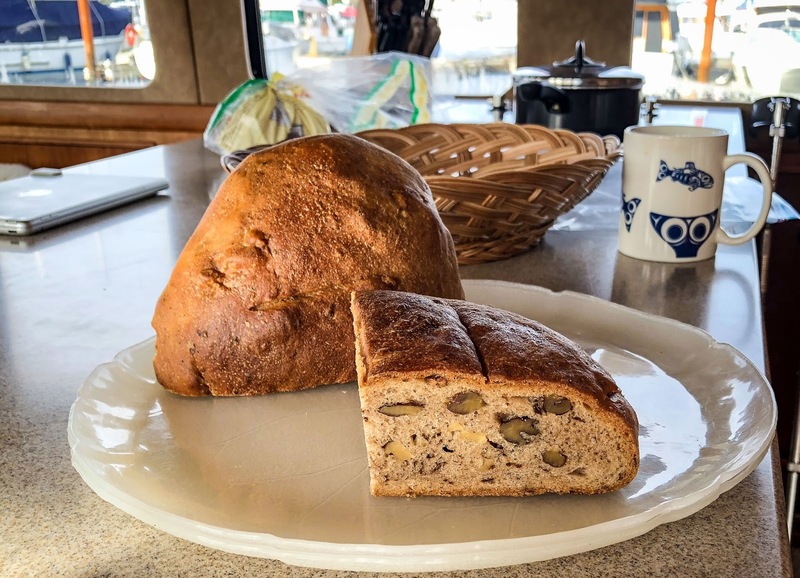 Let me know how you enjoy your version of Walnut Bread. Place water and yeast in a large bowl; stir and let stand until active; stir in the cup of flour. Cover loosely and set aside in a warm place for an hour, or until bubbly. Uncover and add the nuts, water, yeast, salt, oil and pepper to the mix. Add 4 cups of the flour in 1-cup increments and stir to mix. Add additional flour as needed to result in a slightly sticky dough. Turn out onto a floured workspace. Knead the dough until "smooth and elastic", adding light sprinkles of flour as needed to prevent sticking. Return the dough to the bowl, cover and let rise until doubled in volume. In my kitchen that took 2 hours. On a floured workspace, split the dough in half. With each piece form a round ball, pulling the edges into the center and pressing the seam firmly. Place with seam-side down on a silpat or parchment-lined baking sheet. Cover loosely with oiled plastic wrap and let rise until doubled in size, roughly one hour. 20 minutes before baking the loaves, preheat the oven to 450 F. Slash each loaf with 2 or 3 cuts and place the baking sheet on a rack in the lower third of the oven. Spritz the oven walls with water 5 -6 times and quickly close the door. Spray again after 5 minutes, and again after 5 more minutes. After 20 minutes reduce the oven temperature to 400 F and bake until the loaves are "nicely browned". Use an instant-read thermometer to check the center of the bread for 200 F or higher. Remove from the oven and place on a baking rack to cool completely before slicing. Enjoy immediately or wrap a cooled loaf in plastic or foil, place in a large freezer bag and freeze for up to 3 months. Chicken thighs, massaged with a Moroccan medley of spices, browned in a splash of oil and nestled in a pool of broth for stovetop braising yield a flavorful, succulent entree. Top the dish with a tangy lemony sauce and shazam! this becomes another weeknight favorite. It won't win top honors for beauty, but with some creative plating it might appear at a company dinner or two in the future. When rushed for time I've prepared this in the pressure cooker, but feel more in control of the results with stovetop braising. Either way, Moroccan Chicken is a surprisingly tasty dinner item; much more than the sum of its parts. 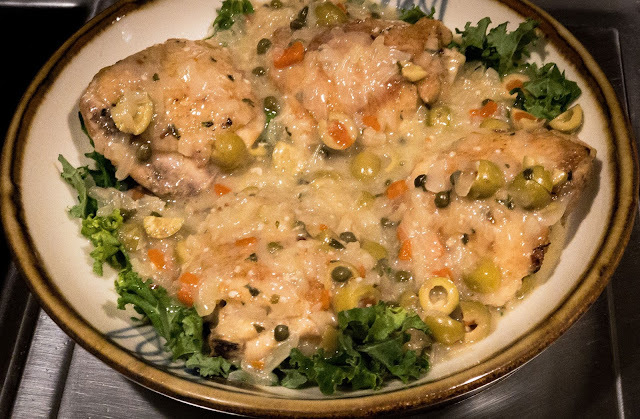 What more could you ask of the ubiquitous chicken thigh? Combine the spice rub ingredients and rub the mixture over both sides of the chicken. Set aside for 10-15 minutes while you assemble and chop the remaining ingredients. Heat the oil in a skillet over medium-high heat. Sear the thighs on both sides until lightly browned, about 5-6 minutes total. Remove to a plate; set aside. Remove all but a tablespoon of fat from the skillet; add the onion and garlic and cook for a minute or two until the onion softens. Add the chicken broth. Place the thighs back in the skillet, presentation side up; cover and cook over medium-low heat until chicken is no longer pink, about 30 minutes. Line a serving bowl or rimmed platter with the julienned kale (if using). 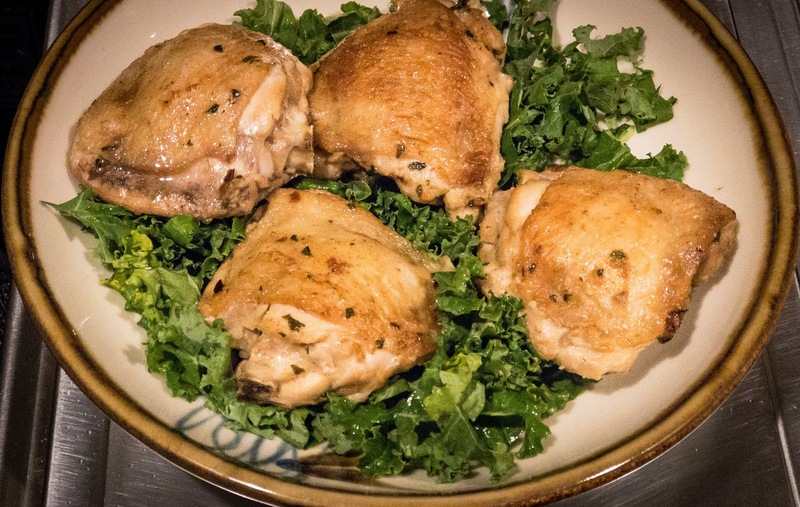 Place the cooked thighs on the kale and hold in a warm oven (or cover with foil to keep warm) while finishing the sauce. 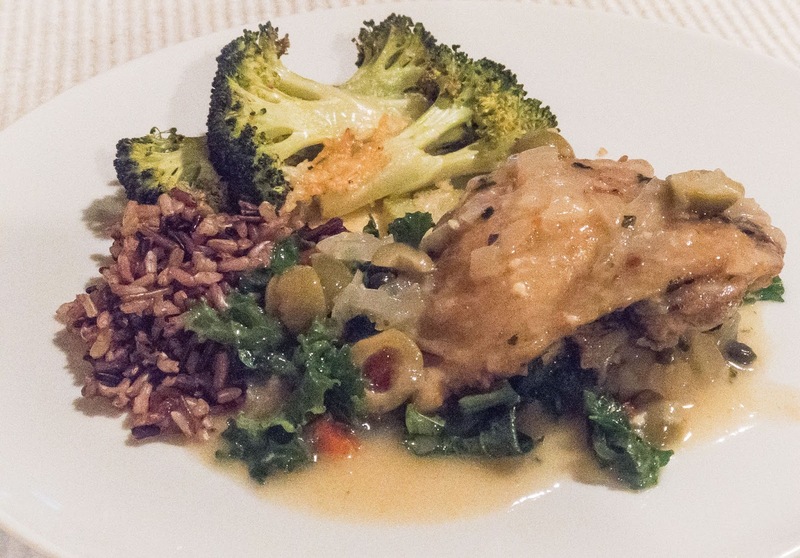 Pour the sauce over and around the chicken and serve accompanied with flavorful couscous or herbed rice. Have you heard? 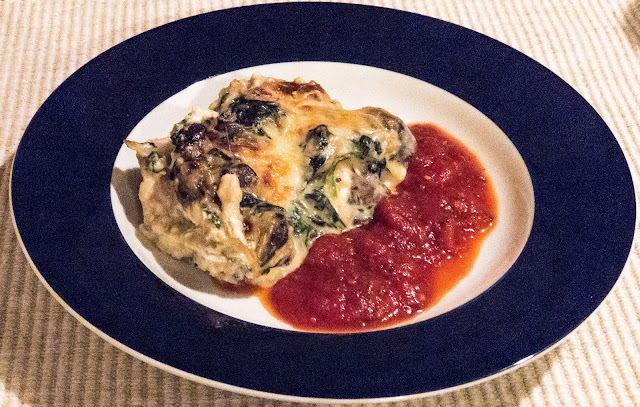 lasagna is the next big food trend. Really?! No, I didn't make that up. I read that startling information online this week as Taste predicted 2018 will be "The Year of Lasagna." Well, for once I am on trend with my recent pan of a creamy white chicken lasagna served with a dollop of red sauce on the side. Mmmmm, I can't help but smile in contentment while remembering the flavors of this favorite comfort food. I won't make any claims for healthy eating with this recipe, just a promise of irresistible palate-pleasing layers of rich, creamy deliciousness. Do you remember your first pan of lasagna? Old school lasagna with red sauce might have been one of my first kitchen achievements as a new bride, along with spaghetti & meatballs, Irene's tuna cashew casserole, and a handful of taco and enchilada concoctions. 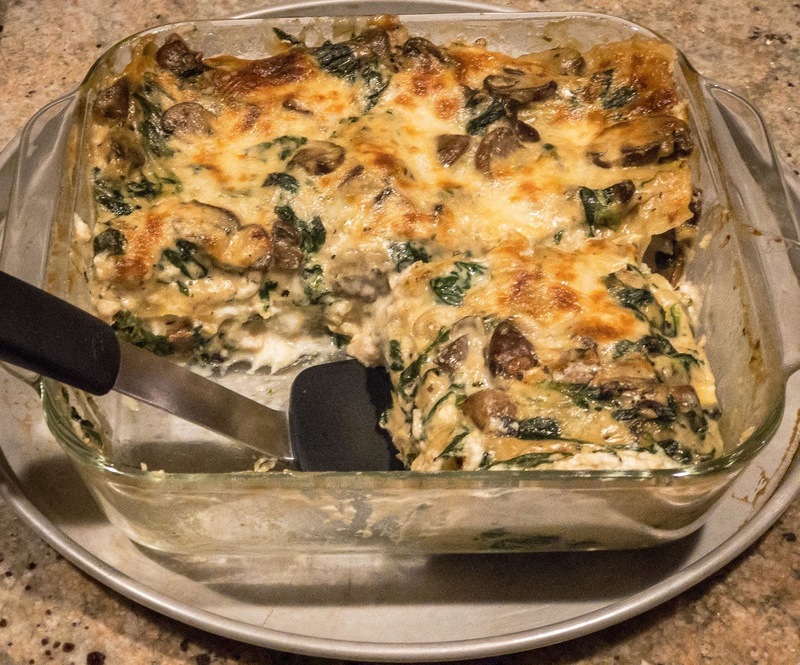 The tuna casserole dropped off the menu decades ago, and my lasagna casseroles have strayed markedly away from the more traditional. Nonetheless, winter weather still calls for a tempting pan of baked pasta. Well-suited for a weeknight meal, or for make-ahead cooking on the weekend to serve later in the week or freeze, this white-sauced chicken lasagna merits repeat appearances. Make a double batch, you will love the convenience of a ziploc bag filled with frozen individual servings to reheat on a busy weeknight. Yes, it's that good and shines as a quicker version of similar but more time consuming recipes. Use no-cook pasta sheets to eliminate one messy step; Italian seasoned chicken sausage will take less time to prep than chicken pieces; and a jar of sauce can substitute for your own homemade red sauce. I won't judge. The lasagna tastes decadently rich and satisfying enough so one 8"x8" dish provides six servings for the two of us. It's freezer-friendly after baking, with individual servings wrapped in plastic wrap, and then a wrap of aluminum foil. I defrost, unwrap and place in individual ovenproof dishes to reheat in the oven. Cover and bake until warmed completely through, then uncover and bake a bit longer to bubble the cheese and crisp up the top. Yum. Preheat the oven to 350 F. Set out the ingredients and lightly coat an 8x8 baking dish with cooking spray. Set aside. To Assemble: Spread a scant cup of sauce evenly across the bottom of the baking dish. Arrange 2 or 3 lasagna noodles on top of the sauce, covering without overlapping. Dollop 1/2 of the ricotta on top of the noodles, spreading it around somewhat; next scatter 1/2 of the spinach. Sprinkle with 1/2 of the nuts, 1/2 of the chicken and finish with 1/3 of the cheeses. Cover with half of the remaining sauce and repeat the layers. Top with the remaining pasta, sauce and cheeses. Cover with aluminum foil, place in the oven and bake for 40 minutes. Uncover and bake for 15 minutes longer until golden and bubbly. OR place under the broiler for several minutes until lightly browned in spots. Let rest for 10+ minutes before serving to firm up. Use a wide spatula to serve, accompanied with warmed red pasta sauce if you choose. Melt butter over medium heat in a saucepan. Add garlic, mushrooms & onions and cook 4-5 minutes until onions are translucent and tender. Sprinkle in flour and cook until flour is incorporated and lightly browned, whisking constantly. In small increments, gradually whisk in the chicken broth and milk and cook until slightly thickened, whisking constantly as it cooks. (The sauce should be loose, not a heavy paste!) Add the basil, oregano and nutmeg; stir to incorporate. Taste; season with salt and pepper to taste. 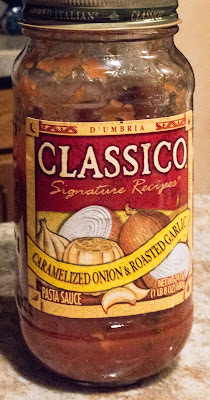 Set aside while preparing the lasagna ingredients.